One Planet Development is a still-young planning policy that provides for granting of planning permission for low impact rural development in Wales. Its aim is to permit development on rural land where it might not otherwise fit with planning guidelines, provided a set of criteria are met about sustainability, impact, the income generated, the level of food requirements met locally, and the level of self-sufficiency of the households involved. So far few applications have been successfully carried through to approval, (Nant-y-Cwm was the first) but there are a number in the process. Taking on the planning authorities, and ensuring that the right information is presented in the right way, is neither a simple process, nor one for the faint-hearted, which is why the One Planet Council was formed. It is a voluntary group, involving planning experts, eco-builders, and other interested parties, to support applicants with their planning submissions. The Council also wants to make sure that the policy continues beyond its review after five years (2016), and that understanding within the planning authorities improves. 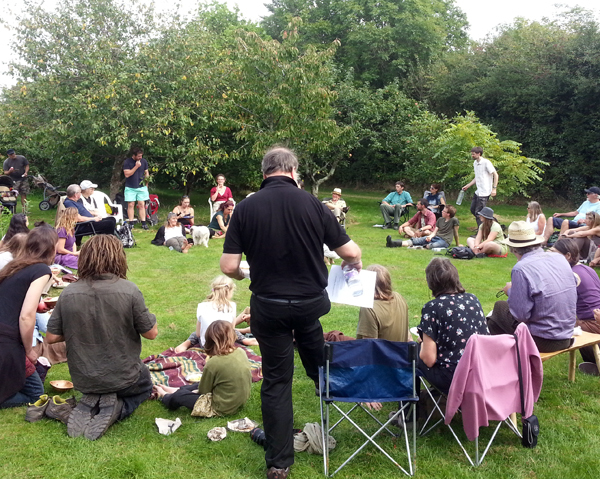 I attended their Autumn Gathering on Saturday 13 September 2014, at the invitation of a member of the council, to find out more, and to offer our support. 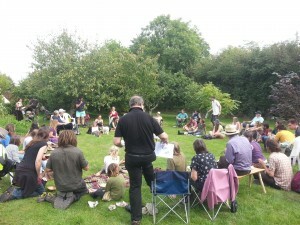 The meeting was hosted by John Hargraves at his sustainable organic smallholding. Around 50 people attended, many of them having successfully made, or currently in the process of making, One Planet applications. The meeting was a great opportunity for the exchange of ideas, and for those thinking of starting down this road to talk to those who are already living it. Several experts in the field also contributed to a full agenda, including David Thorpe, novelist and writer on sustainability, Tao Paul Wimbush, resident at Lammas and planning consultant, architects experienced at One Planet applications, and people already living the One Planet life. It wasn't all work, and the evening saw music, dance, food and a campfire well into the evening. The Council meets every month, in Carmarthen at the moment, and all are welcome. If you are are considering any land that Woodlands.co.uk is offering for sale for a One Planet application, please talk to us.